On the 9th of May, 2015, the Macedonian police launched a dawn operation to arrest an armed group which had infiltrated the country and which was suspected of preparing a number of attacks. The police evacuated the civilian population before launching the assault. The suspects opened fire, which led to a bitter firefight, leaving 14 terrorists and 8 members of the police forces dead. 30 people were taken prisoner. There were a large number of wounded. The Macedonian police were clearly well-informed before they launched their operation. According to the Minister for the Interior, Ivo Kotevski, the group was preparing a very important operation for the 17th May (the date of the demonstration organised by the Albanophone opposition in Skopje). The identification of the suspects has made it possible to determine that they were almost all ex-members of the UCK (Kosovo Liberation Army) . • Sami Ukshini, known as « Commandant Sokoli », whose family played a historic role in the UCK. • Rijai Bey, ex-bodyguard of Ramush Haradinaj (himself a drug trafficker, military head of the UCK, then Prime Minister of Kosovo. He was twice condemned for war crimes by the International Penal Tribunal for ex-Yugoslavia, but was acquitted because 9 crucial witnesses were murdered during the trial). • Dem Shehu, currently bodyguard for the Albanophone leader and founder of the BDI party, Ali Ahmeti. • Mirsad Ndrecaj, known as the « NATO Commandant », grandson of Malic Ndrecaj, who is commander of the 132nd Brigade of the UCK. The principal leaders of this operation, including Fadil Fejzullahu (killed during the assault), are close to the United States ambassador in Skopje, Paul Wohlers. Paul Wohlers is the son of US diplomat Lester Wohlers, who played an important part in Atlantist propaganda, and directed the cinematographic service of the U.S. Information Agency. Paul’s brother, Laurence Wohlers, is presently an ambassador in the Central African Republic. Paul Wohlers himself, an ex-Navy pilot, is a specialist in counter-espionage. He was the assistant director of the United States Department of State Operations Center (in other words, the service for the surveillance and protection of diplomats). You would have to be blind not to understand. In January 2015, Macedonia foiled an attempted coup d’etat organised for the head of the opposition, the social-democrat Zoran Zaev. Four peole were arrested, and Mr. Zaev had his passport confiscated, while the Atlantist press began its denunciation of an « authoritarian drift by the regime » (sic). Zoran Zaev is publicly supported by the embassies of the United States, the United Kingdom, Germany and Holland. But the only trace left of this attempted coup d’etat indicates the repsponsibility of the US. On the 17th May, Zoran Zaev’s social-democrat party (SDSM)  was supposed to organise a demonstration. It intended to distribute 2,000 masks in order to prevent the police from identifying the terrorists taking part in the march. During the demonstration, the armed group, concealed behind their masks, were supposed to attack several institutions and launch a pseudo-« revolution » comparable to the events in Maidan Square, Kiev. This coup d’Etat was coordinated by Mile Zechevich, an ex-employee of one of George Soros’ foundations. In order to understand Washington’s urgency to overthrow the Macedonian government, we have to go back and look at the gas pipeline war. Because international politics is a huge chess-board on which every move by any piece causes consequences for all the others. The United States have been attempting to sever communications between Russia and the European Union since 2007. They managed to sabotage the projet South Stream by obliging Bulgaria to cancel its participation, but on the 1st December 2014, to everyone’s surprise, Russian President Vladimir Putin launched a new project when he succeeded in convincing his Turkish opposite number, Recep Tayyip Erdogan, to sign an agreement with him, despite the fact that Turkey is a member of NATO . It was agreed that Moscow would deliver gas to Ankara, and that in return, Ankara would deliver gas to the European Union, thus bypassing the anti-Russian embargo by Brussels. On the 18th of April 2015, the new Greek Prime Minister, Alexis Tsipras, gave his agreement that the pipeline could cross his country  . 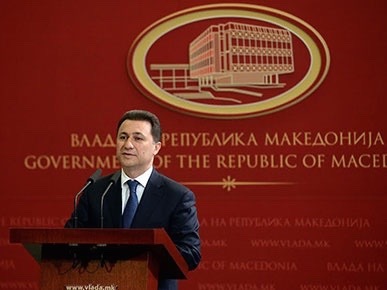 As for Macedonian Prime Minister Nikola Gruevski, he had already conluded discrete negotiations last March . Finally, Serbia, which had been a partner in the South Stream project, indicated to the Russian Minister for Energy Aleksandar Novak, during his reception in Belgrade in April, that Serbia was ready to switch to the Turkish Stream project . - and in Serbia, it has restarted the project for the secession of the small piece of territory - Voivodine - which allows the junction with Hungary . Last comment, but not the least: Turkish Stream will also supply Hungary and Austria, thus ending the alternative project negotiated by the United States with President Hassan Rohani (against the advice of the Revolutionary Guards) for supplying them with Iranian gas . « L’UCK, une armee kosovare sous encadrement allemand », par Thierry Meyssan, Reseau Voltaire, 15 avril 1999. Le SDSM est membre de l’Internationale socialiste. “How Vladimir Putin Upset NATO’s Strategy”, by Thierry Meyssan, Translation Roger Lagasse, Voltaire Network, 13 December 2014. “Moglicher Deal zwischen Athen und Moskau: Griechenland hofft auf russische Pipeline-Milliarden”, Von Giorgos Christides, Der Spiegel, 18. April 2015. “Геннадий Тимченко задержится на Балканах. Вместо South Stream "Стройтрансгаз" построит трубу в Македонии”, Юрий Барсуков, Коммерсант, 12 марта 2015 r.
 «Energie : la Serbie souhaite participer au gazoduc Turkish Stream», B92, 14 avril 2015. “Brussels’s Next Balkans Ersatz State: Vojvodina”, by Wayne Madsen, Strategic Culture Foundation (Russia), Voltaire Network, 7 March 2015. “Behind the anti-terror alibi, the gas war in the Levant”, by Thierry Meyssan, Translation Roger Lagasse, Voltaire Network, 3 October 2014.